Must be a slow news day today. The front page of the City/Region section featured an article about a bill that is currently pending that would lift the alcohol ban on golf courses. Some folks want to be able to drink while they golf. Some folks want to go with their families and not have to deal with rowdy folks that perhaps drank a little too much. For the avid golfers out there, is it a big plus for a golf course if you are able to drink while golfing? Is that something you look for? "I've definitely gone to courses and paid more to go there because I could have a cold beer on the course," Debold said on a recent morning round as he started at the first hole. 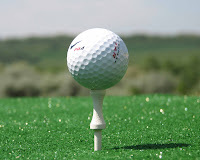 I haven't touched my golf clubs in about two years, and even if I did start up again it would take all my wits and concentration just to make sure I hit the ball. I'm not sure having a beer or two would help my cause. But for the golfers out there, I'll keep my fingers crossed that the ban gets lifted. 0 Response to "Lifting The Alcohol Ban On Golf Courses"